Eastern Washington basketball coach Shantay Legans is expecting great things next spring. So is his wife, Tatjana, who’s due March 29 with the Legans’ second child. “She told me I can miss the birth if we’re still playing then,” said Legans, letting that date sink in for dramatic effect: March 29. The NCAA national semifinals are two days later. “Heck, if we’re still playing on March 29, that would be a lot of fun,” Legans said. But if basketball is about dreams, the 36-year-old Legans has been living the dream ever since … wait for it … last March 29, when he was named to succeed Jim Hayford as head coach. All Hayford did in six seasons was turn the Eagles into a perennial Big Sky contender. Legans was there for all of them, following two previous years under former coach Kirk Earlywine. “I am proud of where we’ve come from and look forward to the places we will go together,” Legans said. In the short term, that means a lot of road trips. The Shantay Legans era opens Nov. 10 against Walla Walla; after that, the Eagles will play 10 straight games away from Reese Court. That should mean plenty of bonding time for an 18-man roster that’s split evenly between veterans and newcomers. The cupboard certainly isn’t bare – the Eagles return three starters in guard Luka Vulikick and forwards Bogdan Bliznyuk and Mason Peatling – but it’s not overflowing either. Eastern (22-12 overall and 13-5 in the Big Sky last year) graduated Big Sky MVP Jacob Wiley and lacks a proven point guard. Based on that, the media and coaches picked Eastern to finish in the middle of the conference, seventh out of 12 teams. “I think we’re better than that,” Legans said. The biggest asset is Bliznyuk, a 6-foot-6 forward who led the Eagles in both scoring (20.6 points and assists (4.0) and was second behind Wiley in rebounding (6.5). “I think we have one of the best players in the league, and he has a chance to be the league MVP,” Legans said of Bliznyuk, who also handled most of the ball-handling chores last year. However, this is the first year that Bliznyuk won’t be complemented by a teammate who can dominate the paint. Last year it was Wiley, and for two years before that Bliznyuk worked alongside Venky Jois. The next big thing at Reese Court is Benas Griciunas, a 7-foot Lithuanian by way of Auburn and UNC Charlotte. 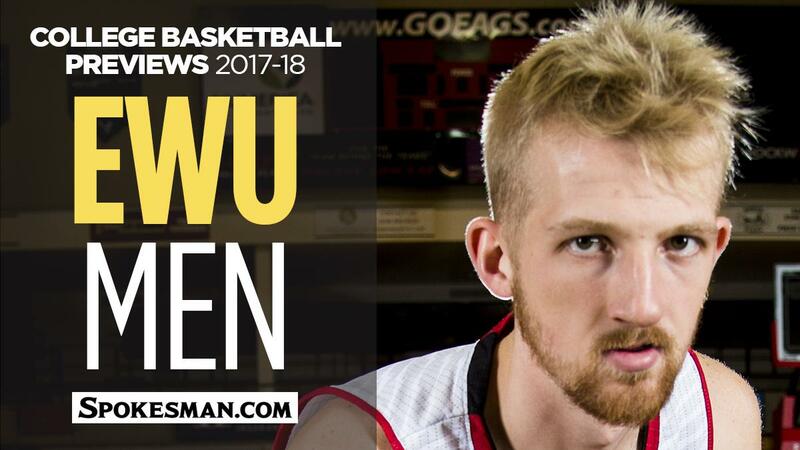 Despite his modest stats (3.0 points and 1.5 rebounds last year at Charlotte), the graduate transfer “is a solid mid-midmajor player, and he’s going to surprise people,” Legans said. Injury cost him one season at Auburn and a coaching transition impacted his playing time at Charlotte, added Legans, who added that despite his size, Griciunas will be able to keep up in Legans’ up-tempo offense. The Eagles also expect get help inside from forward Mason Peatling (4.0 ppg, 3.0 rpg), who started 17 games last year and averaged 16 minutes. Jesse Hunt (2.8 ppg, 2.1 rpg) also should see more playing time. The Eagles – and the rest of the nation – also expect big things from freshman Brendan Howard, a 6-6 forward who was a two-time Gatorade Player of the Year at Great Falls High in Montana. The backcourt should carry a bigger burden this year. Point guard Luka Vulikic and senior Sir Washington lead a deep group that includes returnees Cody Benzel and Ty Gibson. “I’m looking for a strong senior year from Sir,” Legans said. The 6-3 Washington showed his versatility last year while starting 11 games and playing 26 minutes per contest. He averaged 6.6 points – second-most of any returnee this year – along with 3.4 boards and 1.9 assists. Always a prolific 3-point shooting program, Eastern will be counting heavily on Benzel and Gibson from beyond the arc. Both stepped up last year as senior Felix Von Hofe struggled at times. Benzel, a 6-4 junior from Ferris High School, was the top 3-point shooter in Big Sky games at 56.8 percent (21 of 37). Right behind Benzel was the 6-3 Gibson, who shot 50 percent (28 of 56) in league play. For Luka Vulikic, the future is now. The 6-foot-6 point guard from Serbia spent his freshman year easing into the lineup, averaging 16 minutes as “point-forward” Bogdan Bliznyuk handled much of the ball-handling chores. “The transition period is over now, and Luka is eager to show that he can be our point guard on a consistent basis,” coach Shantay Legans said. “He is no stranger to playing a lock-up defense and we think he has a chance to surprise many people this year,” Legans said. Vulikic had a solid start last year, starting 22 of the 32 games he played while averaging 2.9 points, 2.8 rebounds and 0.7 assists while playing 16 minutes per game. He started in every game from Dec. 20 to Feb. 9 as part of a starting lineup that went 8-6 in those 14 games. In a program that’s thrived with strong point guard play, Vulikic’s progress will be a critical as Legans wants to push the pace this year. A Big Sky Conference all-academic selection, Vulikic “wants to learn,” Legans said. Save the date: Nov. 10 at Reese Court. The Shantay Legans era begins against Walla Walla University. Want another reason to attend? It’s Eastern’s only home game until mid-December. In between, the Eagles’ best litmus test comes on Nov. 20-22 in the MGM Resorts Main Event, as the other teams in the field are Georgia State, Prairie View and Eastern Kentucky. December offers more opportunities for a program that’s reached the postseason three straight years. On Dec. 3, the Eagles visit Seattle for a game against former coach Jim Hayford. Four days later, Eastern is at San Francisco, a team the Eagles have beaten twice in the last three years. Finally, Eastern is home for its last nonconference games, Dec. 17 against Cal State Northridge and three days later against Providence of Montana. Picked for a middle-of-the-pack finish in the Big Sky, the Eagles open the New Year with three straight home games against Portland State, Sacramento State and preseason favorite Idaho.